How Strong Will Hurricane Erika Be When It Hits Florida? Although Erika is still currently labeled a tropical storm, weather experts believe the storm could turn into a hurricane before hitting Florida on Monday. As of Thursday afternoon, Erika was moving at 16 mph and had winds blowing at approximately 50 mph, the winds extend 140 miles from its center. Experts believe Erika is on its way to becoming a Category 1 hurricane with strong 75 mph winds. The question is not whether or not Erika will hit Florida, but whether or not it will cross that line from tropical storm to hurricane. It’s possible that Florida could receive anything from a few inches of rain to a full-blown hurricane by Monday. Thursday night and Friday morning will be the deciding factor in what happens with hurricane Erika. As a tropical storm, Erika has already earned a deadly reputation. While blowing through Dominica on Thursday morning, Erika caused flooding and fatal landslides that have killed four people. That number may rise during the clean-up efforts since twenty other people have also been reported missing. Prepare for the worst, urges officials. The South Florida Water Management District has already leapt into action, attempting to prevent issues due to Hurricane Erika by lowering water levels in the flood control system. 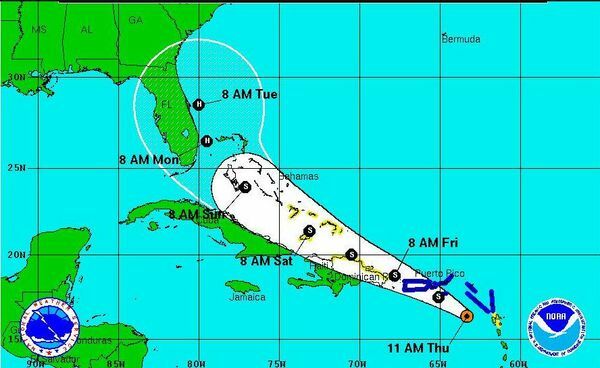 Meanwhile Governor Rick Scott and other officials are concerned that the uncertainty of Hurricane Erika’s path may cause people not to take the storm seriously. They want people to remember to keep checking weather updates as the weekend progresses. Governor Scott is asking residents of Southern Florida to stock up and check on their disabled family and friends. Make sure that everyone has at least three days of medicine, food, water, and other necessities. If what hits Florida on Monday is a hurricane, that extra vigilance could make all the difference to love ones. “Think about each and every family member,” Governor Scott said.